'Tweet Seats' Come To Theaters, But Can Patrons Plug In Without Tuning Out? Some theaters are offering seats from which patrons can tweet about performances and receive information about them in real time. For some, it enhances the experience, but for others, it's a regrettable distraction. 'Tweet Seats' Come To Theaters, But Can Patrons Plug In Without Tuning Out? It's standard practice for theaters to request that patrons turn off their electronic devices before a show begins, and common courtesy for theater-goers to oblige ... until now. Some theaters have started to offer special "tweet seats" from which audience members can follow a play-by-play thread of information about a performance and share their own insights. "To tweet or not to tweet is a question that many performing arts organizations have wrestled with [for] the past few years," says Chris Pinelo of the Cincinnati Symphony Orchestra (CSO). For its part, the CSO decided to take up thumbs against a sea of glowing screens — or at least 25 of them. The organization has gotten a generally favorable response for its small section of "tweet seats" from which patrons can follow a designated hashtag on their mobile devices or tablets. "Basically, it functions like interactive program notes," says Pinelo. "So you have an assistant or associate conductor backstage giving some insights into the music you're experiencing, and then you're able to respond, and it's like a digital conversation." Pinelo is quick to point out that following live tweets while taking in classical music is not for everyone. 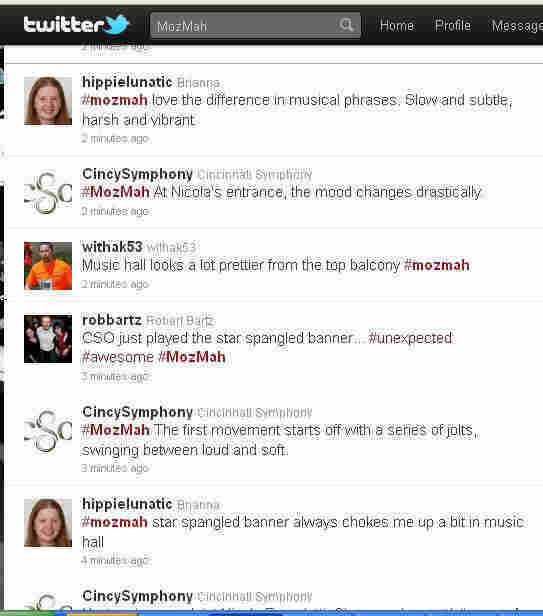 But a few patrons who followed the #mozmah hashtag for a performance of music by Mozart and Mahler liked being warned about ensuing crescendos and getting historical information the pieces. I caught up with Mary Lowe, 46, in the Twitterverse to ask how she liked following live-tweets during the concert. And she tweeted back, "There were points at which I might have said more, but didn't want to be distracted from the visual part of the performance." Lowe says she was not at all tempted to tweet about other things, play a round of Angry Birds, check e-mail, or fall victim to one of the other myriad distractions literally at your fingertips with a smartphone or tablet. "Oh! Wow." she tweeted on the topic when I asked her about it. "No, it never occurred to me to do anything but enjoy the music and talk about it." Robert Baz, who was also in the CSO's tweet seats agreed that the tweet seats offered an added thrill to show, even though he may have snuck in a couple of breaks. "I may have checked email/Facebook once or twice," Baz tweeted to me, "otherwise just rather stay with the concert 1st and Twitter 2nd." Not everyone has the restraint to keep from jumping between a dozen apps in a dark theater where everyone peers into their phones like crystal balls, but then again, not everyone has the attention span for the symphony. Lucky for those who don't, patrons are being encouraged to tweet during other kinds of performances as well, including musicals, ballets, and even opera. Tweet seats will be offered by the Palm Beach Opera (PBO) in Florida for the first time for an upcoming performance of Madame Butterfly. Audience members will have to try to avoid getting whiplash as they divide their attention between phones or tablets, the actors, and the supertitles projected above the stage that provide translations of the Italian opera. "It definitely takes a certain kind of mind to be able to take in all of that and make sense of [it]," says Ceci Dadisman, the Opera's Marketing Director. And indeed, in offering tweet seats, the PBO is looking to draw in a certain kind of audience member. Dadisman says, "As you might guess, the median age for an opera-goer doesn't quite line up with the median age for someone that uses social media, and I really view social media as a way to both engage younger people and also engage people that might not be the ones to stand in line to get an opera ticket." It seems to be working. The 20 tweet seat tickets offered by the PBO are selling out quickly. Still, not everyone's a fan of bringing the internet into the theater. A recent survey conducted by the Washington Post found that over half of respondents didn't approve of the "tweet seat" phenomenon. They agreed with the sentiment that "People should be able to turn off their phones for two hours." And some smaller venues worry that audience members will be distracted by the speed-tweeting thumbs of their neighbors. Home to a three-quarter thrust stage with only three rows of seats, the Metropolitan Playhouse in New York City can't consider introducing tweet seats without thinking of the disastrous effect the glowing screens would have on its lighting design. But Alex Roe, artistic director at the Playhouse, has some deeper concerns. He thinks outside interaction, even of virtual kind, might keep people from getting lost in a good play. "Part of the whole theatrical experience is the thought of being present in the company of the rest of the audience and the actors," says Roe. "To me, the thought of encouraging people to tweet during a performance is necessarily a violation of that agreement." He says he'll be making the announcement for patrons to turn off their cell phones for a long time to come.